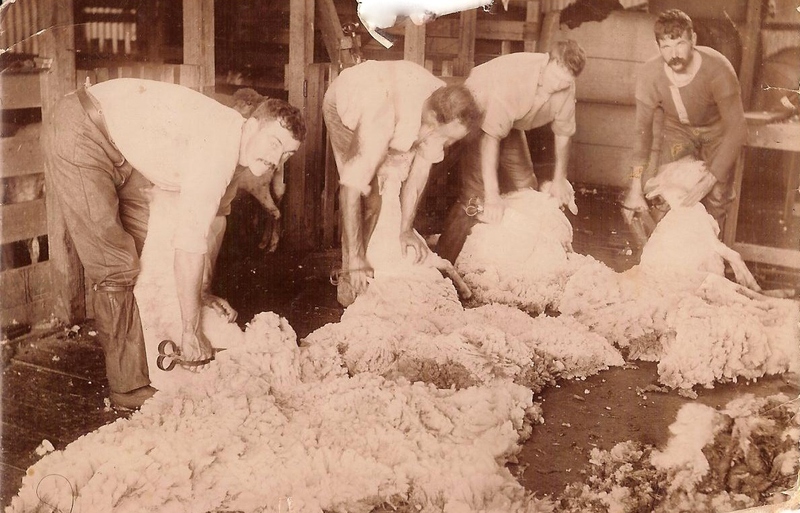 The subject of my 2013 Anzac Day post was great-grandfather Les Combridge. I wanted to include a photo of Les and I couldn’t get one of Grandmas’ photos in time, but I knew I had a large envelope with information Grandma’s sister Jean had sent me. There were photos in the envelope but I couldn’t remember if there was one of Les. Well, I searched everywhere for that envelope and I couldn’t find it. That’s right, I’m not an organised genealogist and to qualify that, I recently joined a Facebook group The Organized Genealogist. I doubt it will help me. Over the past weekend I stumbled across the envelope. It wasn’t lost. I always knew it was somewhere. I just had to find that somewhere. The envelope has a treasure trove of information about the Combridge family and should have demanded my immediate attention when Auntie Jean first sent it to me. But you know how easy it is to get sidetracked. There were no photos of Les. Instead there was one of his father Herbert John Combridge. Herbert was born in Geelong in 1873, the youngest of 12 children of John Combridge and Martha Baker. John and Martha had arrived in Geelong in 1855 from England. Herbert married Jane Wyatt in 1895 at Kyneton. The minister was Herbert’s brother John Robert Combridge, Church of Christ minister at Kyneton at the time . Herbert and Jane went back to the Geelong district and my great-grandfather Leslie Herbert Combridge was born in 1897 at Steglitz, west of Geelong. By 1900, Herbert, Jane and Les had moved to Grantville in Gippsland where the remaining three children to the couple were born. On the back of the next photo someone had written”Les and Claude”. Claude was the younger brother of Les. However Auntie Jean had written underneath “not Les and Claude”. She seemed fairly emphatic about that and I do agree with her. The photo is too early for Les and Claude and there was a 10 year age difference between the two. Given the photos came from the same source, a cousin of Auntie Jean, and there was also information about the Geelong Combridge’s, Auntie Jean was probably given the photo for a reason. I suspect this is another photo of Herbert Combridge. The first step was to follow-up on the photographer, “Wilmot of Malop Street, Geelong” to establish a time frame. 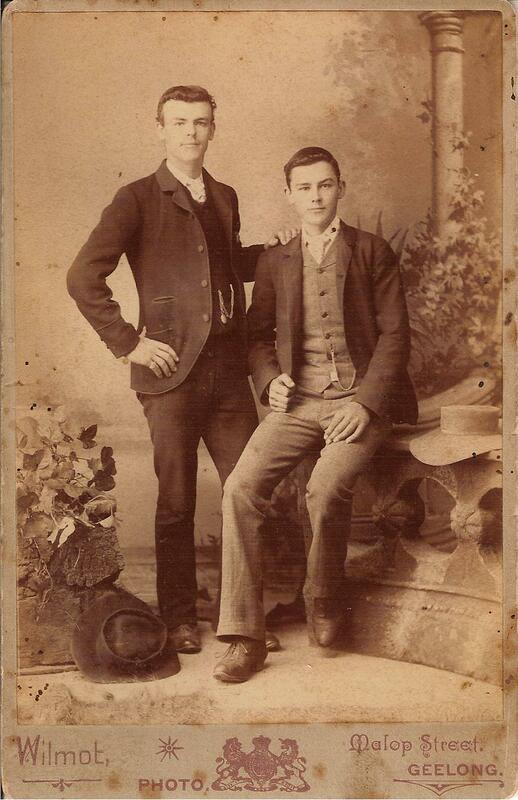 The Geelong District Local and Family History site includes a useful Geelong and District Photographers Database. “Wilmot” was George Wilmot, in business in Geelong from 1865-1923. He started off with William Keys in 1865-1886, then went out on his own in 1886, first in Fyans Street, then from 1891 to 1923 in Malop Street. From Trove photographs, I knew that when in business with Keys, the business name at the bottom of the photo was “Wilmot and Keys”. The logo on the border changed a lot over the years and I only found one other with a coat of arms, that being from around 1907. 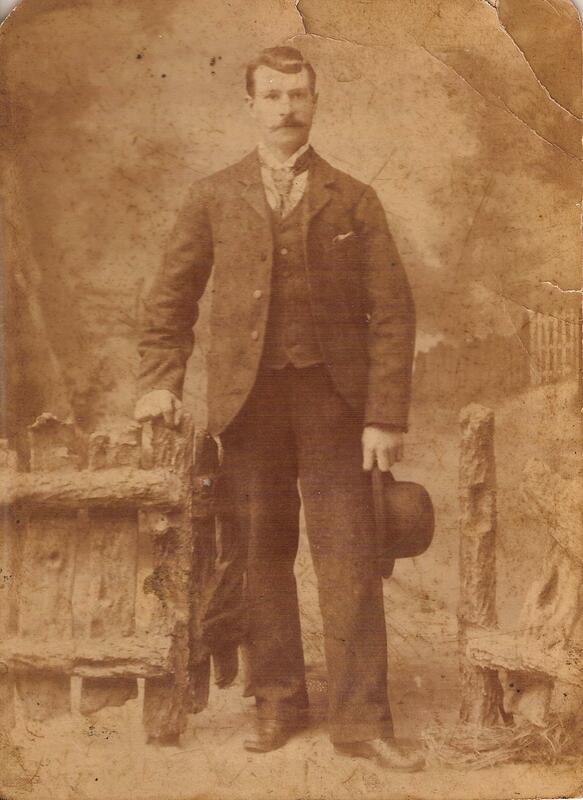 The photo was likely taken after 1891 when George moved his business from Fyans Street to Malop street. Herbert was 18 in 1891. The boy on the right looks younger and I suspect they are brothers. If it is Herbert, he’d be on the right as he was the youngest child in the family. Benjamin was the next eldest by two years. Benjamin would have been 20 in 1891. If Herbert, the photo would be from before his marriage in 1897 when Herbert was aged 24. The time frame would then be 1891-1897. What do you think? I know that while I have learnt a lot about Ladies fashion writing seasonal posts that have proved useful when trying to date photos, I don’t know a lot about men’s clothing, so that’s penciled in for a future post. Of course this may not be Herbert at all. You may remember from the Anzac Day post that Herbert’s wife Jane died in 1909 as a result of childbirth. In Auntie Jean’s envelope were two cemetery receipts, a sad reminder of that year. The first receipt, from July 27, is for the interment of a stillborn baby. The charge 17/6. Then from December 14, a receipt for the burial of Jane. The charge £1. Now, you’ll be pleased to know, all the gems in Auntie Jean’s envelope are scanned and the originals in a safe place. I suppose that’s one step toward being more organised. This entry was posted in Miscellaneous and tagged Combridge, Grantville, Wyatt. Bookmark the permalink. You’re a pretty good a tress, Merron. From the quality of your posts I’d say you are very organised. Thanks Jill. I do a pretty good impression of a duck. My legs are paddling hard below the surface.